This is designed for a full ice practice of about 60 minutes. The practice focuses two types of breakouts where the defense have to gap up and transition to take on a 1 on 1 or 2 on 1. The practice ends with a 2 on 1 with backchecker drill that is also a great conditioning drill. 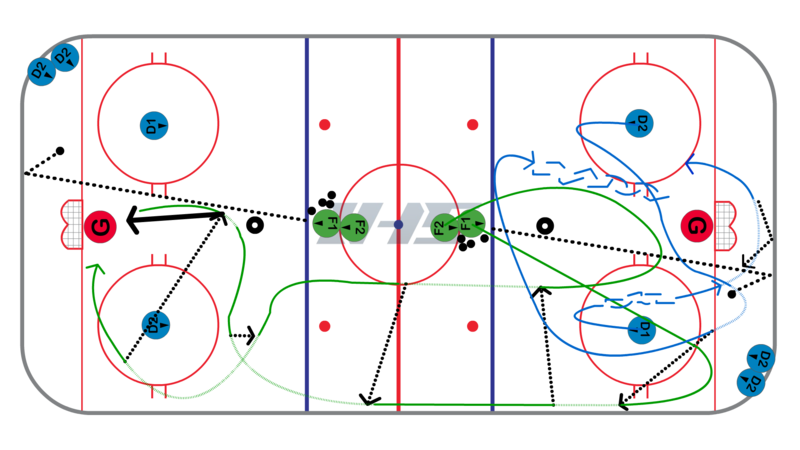 This is a good full ice warm up drill that involves a couple passes and a shot from the high slot. Most of the time in this drill there are four player in action at the same time although the repetitions are slightly staggered. To set up place four equal lines in each corner. In this case lines 1 and 3 (Green Lines) will go first. Lines 2 & 3 will go when the first two players get to the blue line. P1 starts with a puck and skates along the wall into the neutral zone. P2 starts without a puck along the wall into the neutral zone and then swings into the middle to receive a pass from P1. P2 receives the pass and enters the zone where they came from. They stay wide and carry the puck down below the dots. If they are on their forehand they can get on their inside edges and wait for P1 to present a target in the high slot. If they are on their off-hand they can open up so they are making a hard forehand pass. P1 will receive the puck in the high slot and shoot. Encourage players to receive and shoot as quickly as possible. 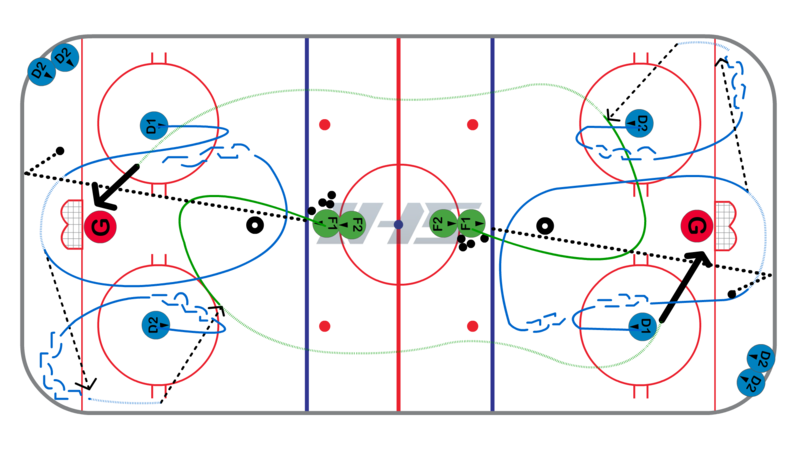 Make sure players skate deep into the zone and to make a low to high pass to the second player in the high slot. This progression requires two defense at each end. They will do a simple "D to D" breakout and then pass to the center who will take on the defender from the other end in a 1 on 1 situation. Make sure to time the swing through the slot so they are receiving a horizontal pass and not a vertical pass coming through the slot. If defender has good gap control then move feet and drive hard to the net protecting the puck. This is a continuous 2 on 1 with a backchecker. It is optional to include the defense in the offensive rush to create a 3 on 2 situation. The pucks are with the coach at center ice. 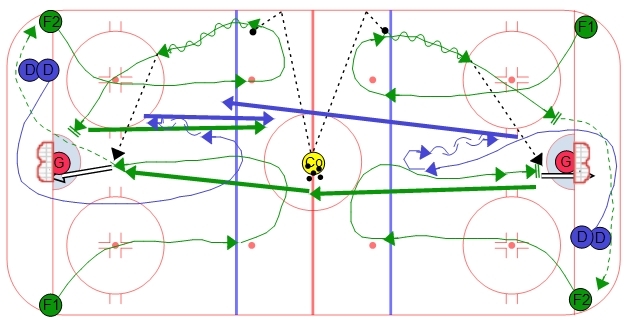 On the whistle F1 and F2 sprint out of the zone inline with the dots. The coach signals which way to transition and the forwards react to the coach. The strong side forward opens up and the weak side forward supports. At the same time, D1 skates around the net and re-takes as much ice as possible to play the 2 on 1. After the initial rush at the net, the coach blows the whistle and the players do the same thing from the other side. On the same whistle, F2 backchecks against the players starting from the other side. They need to communicate with the D if they can pick up the weak side. If you are including the defense, then D1 also skates to the other end and looks to become a trailor to make it a 3 on 2. The drill continues back and forth on the whistle. The player that comes from the F2 line is always the backchecker. F1 should go to the F2 line after the whistle.